If you have just been told that your newborn baby has a condition known as Erb’s Palsy, a form of brachial plexus palsy, there are several things you need to know in order to provide the best treatment for your child. Erb’s Palsy typically occurs during a difficult labor and delivery process. If a baby’s head and/or neck are pulled too hard during labor or delivery, or if the head or neck is twisted or bent too far, a brachial plexus injury may occur, resulting in Erb’s palsy, which is also known as Klumke’s palsy. Brachial plexus injuries can cause partial or complete paralysis of the shoulder, upper arm, elbow, forearm, wrist, hand, or fingers. Obstetricians sometimes use forceps or vacuum extractors in an attempt to get the baby out of the birth canal. Unfortunately, the incorrect placement and use of the forceps or vacuum extractors can create a severe stretch of the nerves on one or both sides of the baby’s neck, causing a Michigan birth injury. If you believe that your child has Erb’s Palsy, physicians will need to examine the infant to determine the severity of the nerve injury. Some children will get all their feeling back within three months to two years. More severe Erb’s palsy cases, however, can leave a child with paralysis. Erb’s Palsy parental education is important in the very early stages of your child’s diagnosis to provide the best treatment for your child. If your infant was diagnosed with Erb’s Palsy in Michigan, you should contact an experienced Detroit birth injury attorney for legal advice. 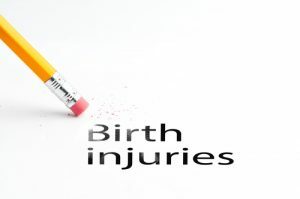 Birth injuries leading to Erb’s Palsy are frequently caused by medical negligence. You and your child may be eligible to receive compensation for pain and suffering, medical bills, physical therapy, and medication. If you and your family have been affected by Erb’s Palsy, contact Thurswell Law today for your free consultation. We understand how difficult this time in your life can be, and we want to help you obtain justice and proper compensation for your child. We have more than 42 years of experience representing the families of injured infants, and we won’t charge you any fees unless we are able to obtain a recovery.